Authorize.net enables also an option for automatic refunds from WooCommerce. 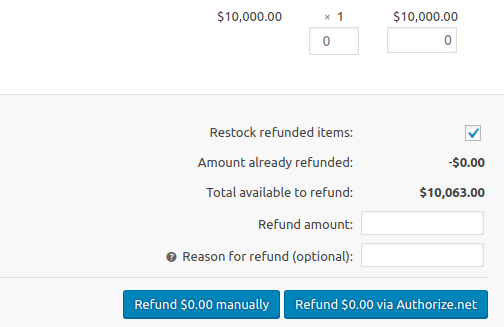 In order to do it, you have to go to “Order details” page of the order you want to refund and click on “Refund”. Now you can specify the sum you intend to refund and click on Refund via Authorize.net. It may happen that refunds are not processed and that an error is returned; this generally happens because before making a refund, the transaction has to be set as “settled” by Authorize.net. In case of error, if you refresh “Order details page”, you should be able to see a note with the reason for the failure of the refund; in any case, a note will be added in log files.